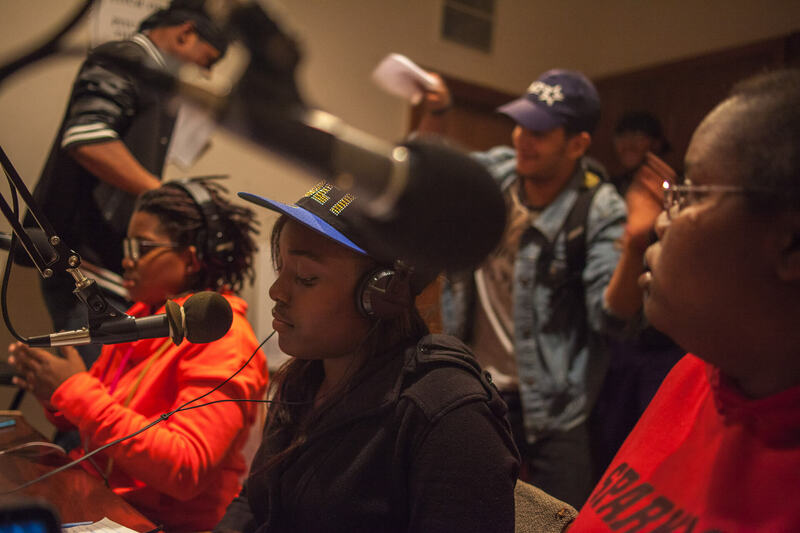 Project South youth organizers host a bi weekly radio program, Youth Speak Truth, that airs on WRFG, a community radio station in Atlanta. Photo courtesy Project South. Hi, I’m Anna. I’m an editor here at Scalawag, and while I’ve been doing my part to help produce this wonderful magazine, I’ve also been working on another media experiment with an organization called Project South. Recently, we published a report about what we’ve been up to. I want to share it here, because Scalawag has played an important role in shaping what could become a powerful force for reporting on social movements in the South. Once when I was visiting a Northern state, someone asked me if there are any liberals in the South. Dumbfounded, I reached for a reference that would be familiar to him. “Where do you think all the people from the Civil Rights Movement went?” I said. “Where do you think their children and grandchildren are?” I assumed he was asking me if there were people who valued and fought for justice in the South, though it later occurred to me that those things aren’t implicit in the term “liberal.” Maybe he was just asking me if there were middle class white people like him who read The Nation. Of course, they are in the South too. The South has everybody. Either way, it’s true that there are vast numbers of people across the South who are fighting for the survival, well-being, and self-determination of their communities. It’s also true, as this person’s question demonstrated, that the ups and downs of these struggles are unknown to many people both within and outside the region. The Greene County Democrat newsroom in Eutaw, Alabama. Publishers Carol Zippert and John Zippert (standing) led a successful campaign to take over the paper from racist editors in the 1980s. Photos courtesy of the author. Did you know that municipal workers in Greensboro, North Carolina, recently fought for and won a union? Or that refugee groups in Clarkston, Georgia, successfully pushed for a city ordinance that prevents local law enforcement from helping ICE detain undocumented people? How about that formerly incarcerated people in Alabama crafted a bill and got it passed, restoring voting rights to thousands of people with felony convictions? Hopefully you know that this month the Federation of Southern Cooperatives celebrates fifty years of fighting to protect Black farmers from land loss and discrimination, and that next month the Highlander Research and Education Center celebrates 85 years of training and supporting Southern organizers who have catalyzed liberatory change on many fronts. These short-term wins and long-term movements matter not only to the Southerners who are more free as a result. They also matter nationally and globally, because the South is a testing ground for oppressive systems and policies that are eventually exported to other regions via the nation’s largest conservative Congressional delegation. Repressive and regressive policies remain intact through entrenched voter disenfranchisement and corporate investment, including corporate-controlled media. Movement wins create space for community-led solutions, but how do they spread and build to ultimately challenge the right-wing stronghold on the South if they don’t get widespread attention? When we talk about “movements,” we mean people coming together to build the power of everyone to collectively control the conditions of our lives and our communities. Movement journalism is investigation and reporting in the service of the social, political, and economic transformation necessary to make this vision of grassroots power a reality. We set out to take stock of independent media infrastructure in the South, explore experiments and innovations in the journalism field nationwide, study the history of movement journalism and what it has to teach us, and collect input from organizers, media-makers, and cultural producers throughout the region. 1.) There is a rich legacy of journalism rooted in struggle. In the journalism field today, there’s an ongoing debate about whether journalists can and should be neutral, versus staking a claim in the issues they cover. Historically, oppressed peoples have used journalism to contest their subjugation and disseminate information critical to freedom struggles. We looked to journalists of color like Ida B. Wells, who was pushed to investigate lynchings after three of her friends were murdered by a white mob. Another white mob burned the office of the Memphis newspaper she owned in 1892, but Wells continued her work as both an investigative journalist and activist dedicated to abolishing lynching. We concluded that our approach to journalism, while not embraced by everyone in the field today, has powerful precedents (as well as plenty of contemporary examples) that we should build upon. An excellent resource for further reading on this topic is, “News for All the People,” by Juan González and Joseph Torres. “Out of Struggle,” a report published by Project South. 91 radio stations –– There’s WYDO, started by a migrant workers’ rights group in Nashville, Tennessee, and WKCG in Dothan Alabama, founded by a formerly incarcerated pastor who works with prisoners to challenge mass incarceration, to name just two. 85 Black-owned newspapers –– The Green County Democrat in Eutaw, Alabama, is an inspiring example. Its publishers are long-time civil rights organizers who led a successful campaign to take over the paper from racist, white editors in the 1980s. 28 alternative weekly papers –– These papers have a long history of critical reporting, and some are now looking for ways to expand their reach, like the Arkansas Times in Little Rock, which recently launched the Arkansas Nonprofit News Network to produce and disseminate stories with “the potential to bring about change” throughout the state. 25 community access television stations –– At these stations, like The People’s Channel in Chapel Hill, North Carolina, anyone can learn to produce content for television, access the necessary tools, and broadcast their work. A handful of regional publications –– Like Scalawag! And like Facing South, the online successor of Southern Exposure, a magazine that published investigative reporting about the South for decades. More than 90 radio stations across the South engage in various forms of movement media. Many of these outlets are under-resourced, and those that we spoke with could quickly name important investigative stories and creative projects they would tackle if they were able. They expressed interest in being part of a network that could offer quality syndicated content, greater capacity for original reporting, access to shared tools and resources, and opportunities for collaboration. 3.) Connecting independent news organizations and fostering participatory journalistic methods can make their work more broadly impactful. The financial failure of newspapers over the past decade no doubt created a crisis in journalism. But it also led to some fantastic new journalism projects designed to fill in the gaps where legacy news organizations have fallen short, foster collaboration between newsrooms, and directly involve the public in newsmaking. For example, Chicago’s City Bureau trains community members to produce investigative reporting on themes decided in public forums. The Boston Institute for Nonprofit Journalism (BINJ) supplies hard-hitting stories to various publications by supporting a network of freelancers who hone their skills through collaborative reporting. BINJ has created a public presence with pop-up newsrooms and other creative strategies that enable the public to shape their coverage. These and other projects offer models we can draw on to make journalism directly responsive to communities engaged in social movements. 4.) We need to change how mainstream media cover social movements, and how national media cover the South. As Carlton Turner, Executive Director of Alternate ROOTS, told us, “The national media uses Mississippi as an example of how not to be.” The same could probably be said of the entire South. When it comes to coverage of social movements, we heard from organizers that media tend to portray campaigns as individual struggles, rendering invisible the power of organizing to transform society. We found promising models for changing these shortcomings, including coordinating op-ed placements, creating a clearinghouse to connect journalists with grassroots sources, and working directly with editors to improve their coverage, and in turn, expand their readership. 5.) Access to strategic media engagement services can benefit grassroots groups that journalists are overlooking. In frontline communities, the people doing impactful work often don’t have the extra capacity it takes to make journalists pay attention to their work and tell their stories right. We conducted a case study in which I served as a media specialist for The Ordinary Peoples Society and the Free Alabama Movement as they organized an historic, nationwide prison strike in September 2016. We found that working directly with organizations and providing specialized support can dramatically improve media coverage. We looked to the Twin Cities Media Alliance, which publishes the Twin Cities Daily Planet and offers media trainings to the public, for ideas on how a media organization can both provide media relations services and operate an independent newsroom. 6.) There are creative and principled ways to fund movement journalism. We found several initiatives, like the Banyan Project, working to create cooperative newsrooms financially supported by members. Syndication is a traditional revenue model that continues to sustain independent media networks like The Pacifica Network. And the Center for Cooperative Media at Montclair University is developing the concept of Community Information Districts, where community media would be funded through a local tax or fee. There are myriad ways independent media have found to create additional revenue streams, from rewards cards, to merchandise, to events. Combining some form of membership structure with a strategic combination of funding sources can ensure that movement journalism is sustainable. We don’t know yet what exactly a Southern People’s Media Network will look like––now that we have this foundational knowledge, we’re working with organizational leaders, journalism partners, and experienced media makers to hammer that out. What we do know is that we need journalism and a communications infrastructure that advances Southern freedom struggles and amplifies them to the rest of the world. We have the tools to make it happen. After almost four years working at Scalawag, I'm looking back and forward—and sharing what I've learned with a lot of thanks. National media has misrepresented Appalachia for over a century. Instead of launching new initiatives to document this place, they should learn from the wisdom already here.